The zero point on the chart is neutral you are capable of continuing as is on that issue but it is void of any joy or positive emotion, but is also not causing you any negativity. Below neutral are negative conditions. A full abundant life is 100% positive in every category. For the means of giving a sample chart I picked some categories off the top of my head but certainly this is no definitive list of things that makes up an abundant life, they are just the most obvious to me in the moment. SG – Spiritual Growth – This is a big category and can include awakening of spiritual gifts, understanding of basic spiritual lessons, remembering of past lives, all the way to ascension related abilities and understanding. R – Relationships – This category could easily be broken down into several subcategories dealing with family, friends, work, even relationships with animals and the planet. Part of an abundant life is having satisfying relationships in all these areas and letting go of toxic or harmful relationships. T-S – Touch and Sexuality – Touch is a needed aspect of healthy human life. I once read about a study that found that Eight hugs a day was optimum for good health. I wonder how much of us get eight hugs a day. 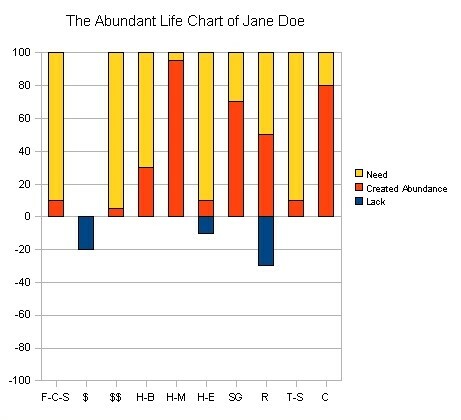 Eight is also the number of abundance so this is a fascinating little tidbit on life. Compassionate loving touch is very important in our abundant life and sexuality can be an aspect of that or for some people is almost a separate category unto itself. C – Creativity – The soul naturally seeks expression whether it is writing, art, music, dance or any other creative medium. Some people have almost no creative expression in their lives and when you meet them they are very closed because of it. Some of us ebb and flow in the movement of our creative energies and may feel blocked in one area and want our abundant life to be a continuous flow of the muse. Our buddy Jane Doe (A.K.A Bambi) has food, clothing and shelter (F-C-S) but its really not of a good quality in some respect. Maybe it is a home not big enough for her family, or made with materials that are not healthy for her, or maybe in a location that does not feed her soul. She is always lacking in money ($) for anything beyond basic survival, but she has a couple small assets ($$) that she may be able to sell if things get more desperate. Her physical health (H-B) is good but she wonders if she can sustain that as she gets a little older. She has a few days when she questions her sanity (H-M) but does not have any mental illness or real difficulty. Her only block to 100 % in the mental arena is not having the full mental abilities of an ascended being. She struggles with the day to day emotions (H-E) in her life as the world seems to get more insane. She vacillates between neutral, feeling great at times, and discouraged at others. She wants to get beyond the times when she gives in to the negative emotions, because she knows that it is not in harmony with where she is spiritually. (SG) She is happy with her spiritual growth and finds comfort in that aspect of her life, but still feels she has a ways to go. Her relationships (R) often bring trouble into her life that contributes to both her spiritual growth and her emotional vacillations. She is spiritually aware enough to understand the dynamic yet still has not managed to break her self free from the obligations and expectations these relationships place on her life. She has relationships that she needs to let go of and some of them may require some big change in another area of her life to be free of them. She has a mate and has touch and sexuality (T-S) in her life on a regular basis but longs for deeper intimacy. Creativity (C) is a positive and rewarding part of her life although she occasionally feels blocked or has some fears about moving into a new create expression. When Jane puts her energy into the abundance project to be expanded with the prayers of the rest of us. The biggest chunk of energy will gravitate to the the blue areas first to uplift them to the neutral line, because they are the greatest need and to start an abundant life we begin from neutral not negative. There is no way for the energy to feed the negative because the intent sits at the top 100% line pulling our energies up to meet it. Some people may feel almost every area of their life is sitting in the blue and that is ok. The thing that is important is the true desire to move up out of the blue, not how much blue you have! So it is easy to see that each of us would have a unique chart and that when we are manifesting an abundant life, it will bring about different things for different people. Someone who has no need of the world’s view of abundance, (money and assets) would have all three of the first categories at 100% already. That doesn’t mean the rest of their chart may not be in a serious world of hurt. HEY PATRICK, still need you to send an email to Engtovo so she can add you to the list for the Abundance Project. Thank you for the abundant life chart and thorough explanation. A visual format speaks to me and helps me to truly understand how this works. I’m sure it will be of great assistance to others as well!